Trends in content marketing are putting an emphasis on producing engaging content over other methods of measuring success. In fact, a recent survey by the Content Marketing Institute revealed that 50% of participants believe producing engaging content is one of the key challenges for B2C marketers in North America. Great writing, proven time over time, is still at the helm of all great marketing but how do you know what your audience likes to read? With over two years of research, AtomicWriter (by Atomic Reach), stems from the idea that digital audiences read differently. Factors like shorter paragraphs, catchy titles, and sentence readability, are crucial elements that impact the success of online articles and your company’s successes. 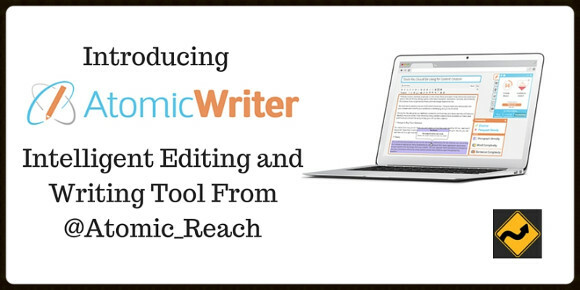 As the first smart editing tool that improves your writing for your target audience, AtomicWriter pulls insights from your readers’ behaviour to make recommendations that will help you really connect with them. It is a tool that reveals who your audience is and guides you through the editing process of creating content just for them. AtomicWriter comes in a neat little Chrome extension or WordPress plugin. There is also a web app right on the Atomic Reach home page for those who blog outside of WordPress or for those who don’t use the Chrome browser, making the tool available to everyone. For editors who have multiple writers, AtomicEditor (found within AtomicWriter) is available to contributors who don’t have admin access to editors’ blogging platform. The app provides 22+ measures giving you real-time feedback as you write your article. Look out for more measures being added as AtomicWriter is always evolving! When users connect their RSS feed, Google Analytics, and social media networks, AtomicWriter learns how your audience likes to read and the kind of content they relate to. It identifies who your audience is within 1 of 5 categories best-suited for their knowledge level. To benchmark your work, a personalized score – better known as your Atomic Score – helps you achieve or exceed your overall average every time you blog. This enables you to get maximum impact in your content’s performance and consistently provides your readers with high quality content. Paired with AtomicWriter, the AtomicInsights dashboard will be able to track your content’s performance, content engagement data, and know the most optimal time to share your content to your social networks. Users are able to see what happens to their content when they hit below or above their Atomic Score. When they hit (or go above) their Atomic Score, engagement usually goes up. This includes unique views, pageviews, social media engagement (shares, tweets, comments) and time spent on page. Whether you are a writer, blogger, editor, content marketer, or freelance writer, AtomicWriter is the perfect companion that will improve your writings skills and grow your blog in the right direction. In addition, if you’re looking for writing jobs, AtomicStudio is a great service that provides writers with opportunities to create content for brands! What do you look for when you’re editing your articles? Leave a comment below and share your writing experience! Have questions? Ask in the comments, tweet to them @Atomic_Reach or join their #AtomicChat Twitter chat every Monday night at 9 eastern / 8 central / 6 pacific. Tonight, our close friend and collaborator Ann Smarty @SEOsmarty is the guest and the topic is taking the guesswork out of guest blogging. Amanda is the Social Media Marketer at Atomic Reach, writing posts, sharing news, and connecting with the community on the daily. Her attempts at clearing her ever-growing reading list continues to be unsuccessful, and she really does believe that sharing is caring. This is one of the best tools I have come across in a long time. What I think is a unique plugin/add-on, I have installed it on my WordPress and let’s see how it works. Thank you so much for reading my article, and for such great compliments on the tool. Since this article, Atomic Reach has updated their UI so it looks very different now, but has the same features. If you need help in getting started, we offer demos, webinars, and video tutorials on how to use each component of the platform. Some great tips here, thanks! I use Atomicwriter all the time. The lovely Leona Hinton just wrote a guest post on my blog you might find equally helpful: 10 Power Tools to Make You an Editing Wizard Thanks! I searched for that title to add the link, but didn’t find it. If you want to provide the link to that post please just reply to this coment. Admirably, I haven’t used Word in a long time. I’m more a of google docs gal, but I really have noticed my writing has improved since using AtomicWriter. It makes you realized aspects of your blog that could be inhibiting its performance, and it makes you into a better writer! Your posted blog is really nice about editing tool. Thank you for post it. Have you tried any writing tools of your own? And what did you think? Nice explanation and work you are done.Hope we will find effective articles in future.It will help new writers content keyword posts. Glad you liked it and thanks for taking the time. Keywords are definitely important when you write blogs, but it’s even more important to use them appropriately. Thanks for the intro, I hadn’t heard of this tool till someone mentioned it recently. I thought I’d look it up and that’s how I got here. It looks like it’ll simplify things for me as I don’t always want to type into Word or an external online tool to just to check the complexity of my content. When everything is within WP it’ll make life much easier. So I’ll be sure to test AtomicWriter. Rhonda Chapman would love you to read ..How can copywriters help you boost search engine visibility? Thanks for taking the time out to read about AtomicWriter. I hope it helps to simplify things for you and that you find the recommendations helpful. If you run into any bugs or have any feedback, I’d love to know! After your first comment they really should go live immediately. I’m not sure why they’re not. I’ll keep approving them and you can send me a message on Skype (username growmap) or tweet @GrowMap and let me know if you need me to go approve them faster. I tried logging in before and I was not able sign in. At this moment, I don’t feel the need to publish reply comments urgently, so I think that it’s fine as is. AtomicInsights is indeed a smart editing writing tool that could help you compose an engaging content. It also helps you predict the possible impact of your content on your readers. Just to clarify, AtomicWriter is a smart editing tool, and AtomicInsights is an analytics tool that shows you which blog post performed the best on your site, social media accounts, and in your Google Analytics. By using the two together (AtomicInsights is offered in AtomicWriter if you sign up for the full version), you can create a blogging strategy that will create the most impact. Thanks taking the time out to read about AtomicWriter! Atomicwriter seems a very useful tool. I am using MS 2013 and it’s always crashing. I should definitely try this today. Thanks for stopping by and reading about AtomicWriter! I haven’t used MS 2013 programs in such a long time. I mainly use Google docs, WordPress, and of course AtomicWriter, for my work now. Writing in-browser allows you to have access to extensions and plugins that will automatically save your work as you go, and improve your writing process. It’s definitely been a transition for myself from MS word, to WordPress, and now adding tools and plugins to mix, but blogging definitely keeps you on your toes since you have to consider what algorithmic changes have been made to search, and trends. So using AtomicWriter to your advantage will definitely help you understand your content and your audience better. If you do give it a try, I’d love to hear what you thought of too! And any questions send em’ my way. Hey, Thanks for the awesome post. I am a professional content writer and hope this tool will lead me to build an effective content marketing strategy. It’s great to hear that you’re excited to tryout AtomicWriter 🙂 Let me know if you need any help or have any questions. This tool will help me with my writing. I cant thank you enough for showing me this. I will be implementing this with all of my writing from this day forward. Thanks for this post and keep up the good work! AtomicWriter offers suggestions on sentence structure (using active voice) and whether what you write is to simple or too complex for your audience. I find it insightful even though it things I’m not “emotional” enough. 🙂 True enough, I’m an INTP and not overly emotional. LOVE the tool and thanks a lot, Amanda, for coming here to explain it! I am using the WordPress plugin which is awesome! Any features you’d like to see in the future AtomicWriter? It’s very kind of you to share with us these atomic content writing information. Thank you for sharing this software. You’re welcome. If you get the chance to give it a try I’d love to know how your experience went. We are continually trying to improve our products and services. Really a cool writer i added into my chrome thank you for the name you suggest. Of course a cool blog. I loved It. Thanks so much for taking the time out to give it a try 🙂 and the kind words about the blog. It’s great to hear that you loved it, did you have any other thoughts about AtomicWriter? Good or constructive feedback is always appreciated. We’re always wondering what new users think of AtomicWriter and are always trying to improve it. Atomicwriter is a great innovation, I am going for it today. We can handle content in a better way due to it. Title, sentence formation, paragraph structure many things that are difficult to handle are now easy. Thanks for explaining AtomicWriter, AtomicInsights, and AtomicStudio so well. I will definitely be on your #AtomicChat tonight to support both @Atomic_Reach and Ann Smarty @SEOSmarty who has been a collaborator of mine for maybe 7 years.